Suppose for a moment that Republican Congressman Ron Paul's fondest wish came true, and the Federal Reserve Bank was not only audited but closed down. As far-fetched as such a notion may seem, it would not be the first time in our nation's history that a central bank has been shuttered. For all the Fed's imposing grandeur, Ben Bernanke is running our third (albeit longest-running) try at a central bank. This country has lived without a central bank before and, if given the chance, could do so again. Most every American (led by Paul Krugman), though, would be horrified at the thought. There are certain functions that, due to their nature, many would argue can only be provided by the political authorities — police and fire protection are the prime examples that come to mind. To the majority of modern men, central banking is without any doubt another. Yet, history tells us that it need not be a government-run affair — private individuals acting outside the bounds of political control have proven entirely capable of providing much the same functions as a central bank, and at a far lower cost, no less. Such was the case with the Suffolk banking system, operated out of Boston from 1824 to 1858. Before the rise of the system, Boston and its environs had suffered from the same monetary confusion as the rest of our Union. Numerous state-chartered banks issued paper bank notes in profusion, with common criminals and (in some cases) the issuing banks themselves counterfeiting freely. For a merchant in Boston and for any city banker who accepted the notes of distant country banks, the risk that a note might not be worth the paper it was printed on was ever present. The relatively poor quality of the country-bank-issued versus the city-bank-issued bank notes triggered Gresham's law — bad money drove out the good. To combat this problem a consortium of seven Boston banks formed the Suffolk banking system, and they invited every city and country bank within the New England area to join. Operations commenced on March 24, 1824, with every member bank required to maintain a permanent, non–interest bearing account at Suffolk, along with an additional account with enough of a balance to clear all paper bank notes presented for redemption. Eventually (and much to the profit of Suffolk) the notes of member banks would be cleared against each other, and loans would be granted for "overdrafts." The system accepted paper notes from all member banks of good standing at par. All paper notes of nonmember banks were immediately sent back to the issuer for redemption in gold. "The Suffolk System … was effective in protecting the public against unsound banks." The original purpose was not to police the currency markets of Boston — that would only come about due to a happy, unintended consequence of the system's operation. The Boston city banks simply wished to broker all the paper notes of the country banks (returning them for redemption in gold) in order to decrease their circulation within Boston proper and open the market for themselves. While they did not succeed in that endeavor, they did succeed in ridding Boston of its infestation by counterfeit or otherwise worthless paper bank notes, so much so that, within the city, notes issued by country banks that joined the Suffolk system began trading at par to those issued by the city banks. The Suffolk Bank itself, upon taking responsibility for the entire system in 1825, rose to become the most profitable bank in Boston. There are some historians who claim Suffolk cannot be labeled a central bank, due to its "lack of quantitative control" over the money supply, but this is not correct. The system most certainly did have control over the money supply; else it would have been entirely ineffective. Unlike the modern central banks, though, the Suffolk system was specifically designed to restrict excess circulation of paper bank notes. The directors would frequently threaten any member bank with redemption of their paper notes for the promised gold if they believed that bank to be inflating beyond the bounds of safety. They were aware of an important economic truth — it is the quality rather than the quantity of money that matters. Contemporaries pointed to the greatest contribution the system made to the people of New England: because it forced all members to maintain a "high ratio of specie to net demand liabilities" the New England banks avoided the carnage experienced elsewhere in the banking industry during the Panic of 1837. The Bank Commission of Maine would later claim that, "The Suffolk System … has proved to be a great safeguard of the public." By 1858 Suffolk was clearing over $400 million worth of notes per year (ten times the entire money supply of New England) and paying out a higher dividend (and enjoying a higher stock price) than any of her peers. Naturally, this meant things were soon to come to an inglorious end. Upon the entry of a competitor (the Bank of Mutual Redemption) into a market Suffolk had previously held all to itself, the Suffolk Bank grabbed its ball and walked off the field in a huff. It was not forced out of business; it simply quit the note-clearing business. In a research piece published by the Federal Reserve Bank of Minneapolis in 2000, the authors ended with the question, "Is there a need for a government-sponsored central bank?" Considering the fact the Suffolk system "grew up without any act of the legislature" we have our answer: "not at all." Rolnick, Arthur J., Smith, Bruce D., Weber, Warren E. 1998. "Lessons From A Laissez-Faire Payments System: The Suffolk Banking System (1825–58)," Federal Reserve Bank of St. Louis Review, May/June. P. 108. Rothbard, Murray. 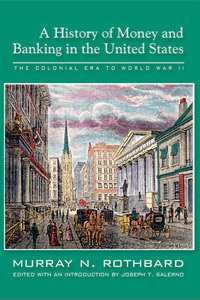 http://mises.org/resources/1022">A History of Money and Banking in the United States: The Colonial Era to World War II. (Ludwig Von Mises Institute, 2002) Pp. 116–117. Lake, Wilfred S. 1947. "The End of the Suffolk System." The Journal of Economic History. Vol. 7, No. 2: p. 191. Rolnick, Arthur J., Smith, Bruce D., Weber, Warren E. 2000. "The Suffolk Bank and the Panic of 1837." Federal Reserve Bank of Minneapolis Quarterly, Spring. Pp. 3–13.